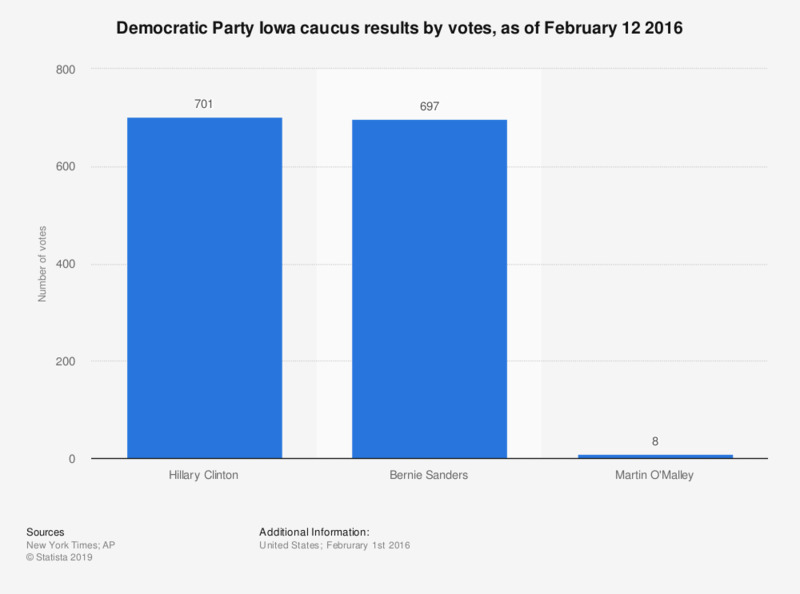 This statistic shows the preliminary results of the Democratic Party Iowa caucus in the race for the nomination to the U.S. presidential election. Hillary Clinton was the winner with 701 votes, slightly above Bernie Sanders with 697 votes. As of February 1 2016, the day of the Iowa caucus, there are only two candidates left in the run for the Democratic nomination for the 2016 Presidential Elections, namely Hillary Clinton, former Secretary of State and New York Senator, and Bernie Sanders, Vermont Senator and former Congressman. Although polls have consistently shown Hillary having an advantage of at least three percent in terms of voter support, she has won the Iowa caucus by a very small margin , with only two delegates more than Sanders. Furthermore, polls regarding the New Hampshire Democratic primaries on February 9 show Sanders as the victor. These neck-and-neck results come rather as a surprise, for both Hillary and many political analysts. After being defeated in the 2008 nomination race by the largely unknown and fresh-faced (by American politics standards) Illinois Senator, Barack Obama, she was expected to run almost unchallenged in 2016. One of her biggest strengths in the race is Hillary’s extensive experience at the very top of world politics, but that also means that she has made some controversial moves, such as the infamous decision to use her personal email address for official communication during her mandate as a Secretary of State or her vote to authorize the start of the Iraq War in 2002. Sanders, on the other hand, prides himself on tremendous consistency of his political views, including gay rights, a very important issue among young Americans; he voted against the Defense of Marriage Act while in the House of Representatives in 1996. Sanders also claims to be the only candidate which does collect money with the aid of a super PAC, thus indirectly Clinton’s fund raising tactics. The Iowa caucus for the Democratic Party serves as the first oppourtunity for voters to express their preferences for the Party's nomination. The votes are State Delegate Equivalents, which represent the estimated number of state convention delegates the candidates would have, based on the caucus results.